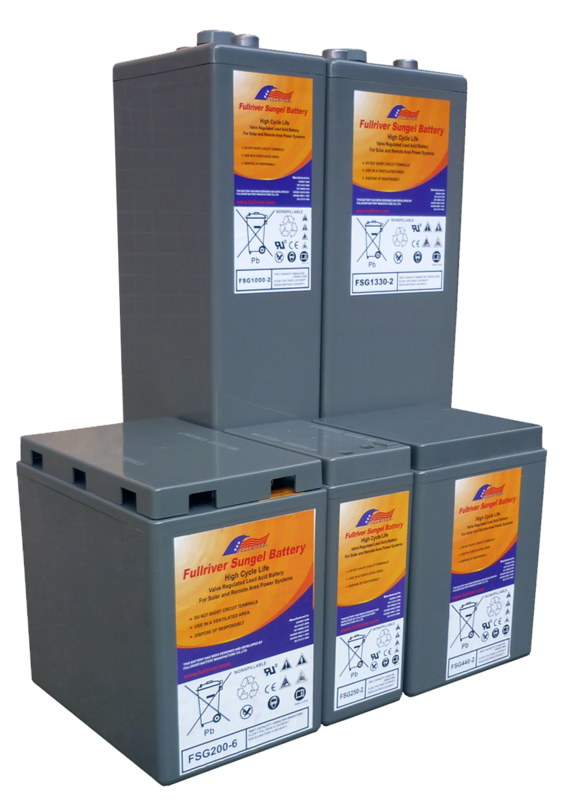 Fullriver FSG Series Valve-Regulated batteries using revolutionary SuperGel long life plate technology have been designed specifically for solar applications. Solar batteries are traditionally hard working batteries and are usually cycled on a daily basis as part of a primary power source of electricity where no grid power is available.When Fullriver developed SuperGel technology, they focused on developing a product with superior life characteristics. Although the SuperGel battery technology is based on previous gel technology, it uses unique chemical and molecular characteristics and differentiated production techniques from regular gel batteries. The superior characteristics of Sungel batteries have been tested and verified by the CSIRO in a number of independent tests the results of which prove the superiority of Sungel batteries under the most extreme test conditions. It typically outperforms other gel batteries by a factor of between 2 and 3, subject to application. Solar applications are often remotely located and installed in the most extreme environmental conditions. To deliver a reliable service with a long operating life requires a unique blend of physical, structural and chemical characteristics.